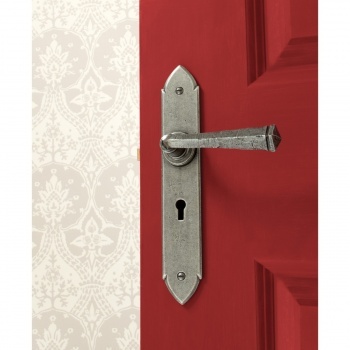 The Lock version of the Gothic handle is designed to be used in conjunction with a Sash Lock which allows locking of your door from the inside or out and is commonly used in front and back doors. 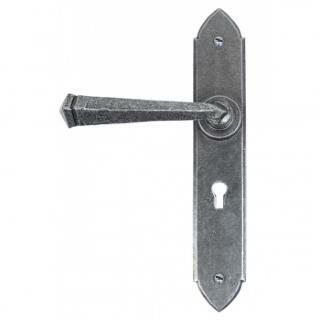 The handle incorporates a strong spring mechanism and therefore can be used with old, existing locks as the handle will always spring back to the horizontal position (see above link). Made entirely from steel these beautifully hand crafted levers are not only pleasing to the eye but also comfortable to use. Sold as a set and supplied with necessary fixing screws. Suitable for use internally or externally. Maintenance instructions must be followed to preserve the finish of your product. See related products below for dedicated external finishes. The beeswax finish is the most authentic finish for steel. When our highly skilled blacksmiths have finished forging this product the colours left in the steel range from blue to deep red ochre. To preserve these beautiful colours and the texture from the hammer and anvil, we apply pure beeswax. This gives a subtle, matt richness to the metal and offers excellent protection when products are fitted internally and properly maintained. To bring out the best in our original Beeswax Finish we advise that before installation it is given a buff with a soft cloth. Using maintenance wax will help restore the finish and give protection to this product. Buffing with a cotton cloth will remove the white bloom. If surface rust occurs, rub with 00 grade wire wool and apply Anvil Maintenance Wax with a rag. All moving parts should be oiled prior to fitting and periodically afterwards. Warning: The chemicals in wet plaster will rust this product. Always fit ironmongery when plaster is fully dry. Our traditional satin Black Finish is baked in a high-temperature oven giving it an attractive, durable and corrosion-resistant finish which is low maintenance and can be used internally or externally. It is resistant to moisture so can be used in bathrooms and damp conditions. 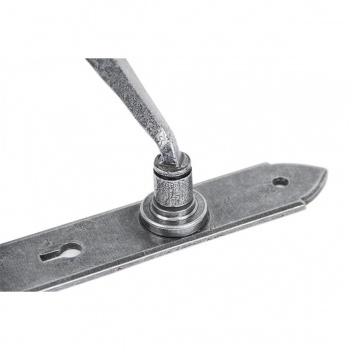 We recommend that the ironmongery is wiped with a lightly oiled cloth from time-to-time. This will remove harmful deposits and restore it to its original condition. All moving parts should be oiled prior to fitting and periodically afterwards. Always use a pilot drill and rub screw with candle wax before fitting. This finish is elegant and beautifully highlights the texture of the steel. Stylish and modern, it is equally suited to a contemporary home as well as a period property. It has excellent anti-corrosion properties and we recommend that the ironmongery is wiped with a lightly oiled cloth from time-to-time. This will remove harmful deposits and restore it to its original condition. Never use any form of metal cleaner or aerosol spray. All moving parts should be oiled prior to fitting and periodically afterwards. 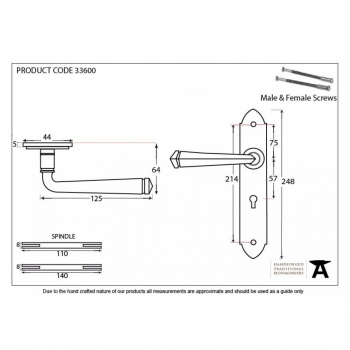 The screws supplied with this product are finished individually so please take care when fitting. Always use a pilot drill and rub screw with candle wax before fitting. This range is coated with a permanent bronze finish which will always look at its best for years to come and is completely weatherproof. This finish is elegant and beautifully highlights the texture of the steel. Stylish and modern, it is equally suited to a contemporary home as well as a period property. All of our Antique Brass products are cast from high quality solid brass and have been manufactured to the highest standards. This finish has been treated to speed up the natural tarnishing process which produces the antique feel of the product. It is burnished making it smooth in appearance and is used as an alternative finish where a highly polished surface is not desired. The finish is un-lacquered, will tarnish naturally and therefore the aged patina will become darker with time. If you require a semi gloss finish, it can be achieved by using Brasso. All of our Polished Brass products are cast from high quality solid brass and have been manufactured to the highest standards. This product is un-lacquered so to retain the original finish, regular polishing with a good quality metal polish is essential. However, if the intention is to allow the surface to age through oxidization, no attention needs to be given. Over time the brass will acquire a darker and more aged patina. A natural cast iron, finished with a clear matt lacquer which produces a beautifully textured look and feel. This product is only intended for internal use. If fitted externally i.e in an enclosed porch or bathroom it will need to be treated with Anvil Maintenance Wax periodically. A natural cast iron, finished with a clear matt lacquer which produces a beautifully textured look and feel. These products are only intended for internal use or when used in a protected area like in an enclosed porch but need to be waxed periodically. A mirror finished, chrome plate applied to a highly polished brass substrate. This Antique Pewter finish is applied to the product and has excellent anti-corrosion properties. Periodic wiping with a lightly oiled cloth will further help to preserve the beauty of this finish. Our Ebony finish products have a rich, dark look and feel for a very distinctive quality. 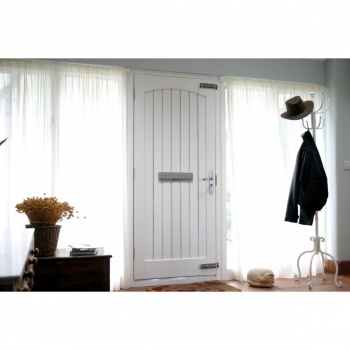 The material has a very high density and fine texture which gives a very smooth finish. Can be polished or waxed to maintain the vibrance of the wood and to give overall protection. Designed to be used internally but can also be used externally if maintained with Anvil wax. Our Rosewood products are strong and heavy with a richly hued reddish colour and much darker veining. Can be polished or waxed to maintain the vibrance of the wood and to give overall protection. Designed to be used internally but can also be used externally if maintained with Anvil wax.